APA-Economics’s correspondent sent to Istanbul reports that the summit will last until November 25. Within the summit the Fifth Organization of Islamic Cooperation (OIC) Halal Expo will last until November 25. Within the summit the Fifth Organization of Islamic Cooperation (OIC) Halal Expo will be held. The summit kicked off with a recitation of verses from the Holy Koran. Later on, Turkish President Recep Tayyip Erdogan’s letter was read. ‘Halal has already become a living style around the world. New technologies are important for extension of geography of the halal trading. This is a significant issue for Turkey. I’m sure that these issues will be comprehensively discussed at today’s summit. I sincerely greet you and wish the event a great success’. 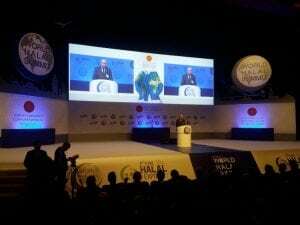 Thereafter, Yunus Ete, the chairman of the World Halal Summit Council, said that the world halal sector is approaching $4 trillion with $2 trillion in Islamic finance products, $1 trillion in halal food, $250 billion in halal tourism, and the rest in instruments such as halal medicine, halal cosmetics and halal textile. According to him, Turkey’s share in Islamic finance is $55 billion: ‘85% of the halal market is constituted from non-Islamic countries’. It was noted that Halal food market of Turkey amounts to $5 billion, which doubles per year. By the end of this year, the halal food market of Turkey is expected to reach $30 billion.